If there is any genre of fragrance I’ve neglected during my time as a fragrance addict then it is most definitely the woods. Why? I really don’t know! Perhaps I’ve just been preoccupied with all of the white florals in my collection (of which there are more than you could shake a stick at) or perhaps it’s down to the fact that woods are often mistreated with the same boring application in a lot of mainstream masculine fragrances. Who knows! I have come late to the woods but they are forgiving me by offering up a fascinating array of scents that I’m now starting to adore and collect. So what do we mean when we say woods? Well the genre is pretty broad but traditionally it relates to any fragrance that focuses on a particular type of wood, with cedar wood and sandalwood being the most popular. 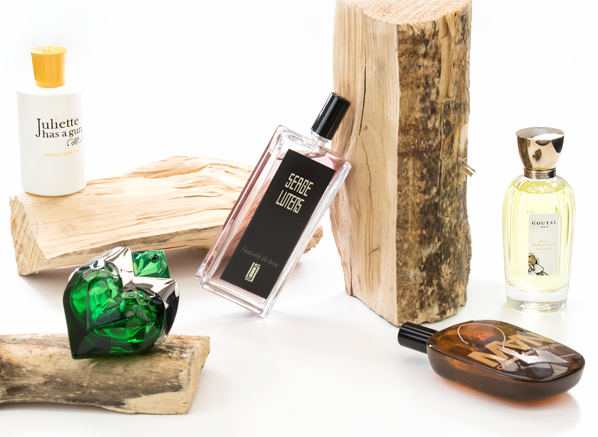 Derived from both real wood materials and synthetic aroma chemicals, woody fragrances tend to have a dry, exotic feel that is unlike much else out there, speaking in an spectrum of nuances that are; hard, hot, spicy, creamy, cool, rich, soft, transparent and so much more. Long live the woods! In terms of woody fragrances, none are more famous than Feminite du Bois. Originally launching in 1992, this scent took the genre of woods and gave it a feminine twist (hence the name) via fruit and spices. 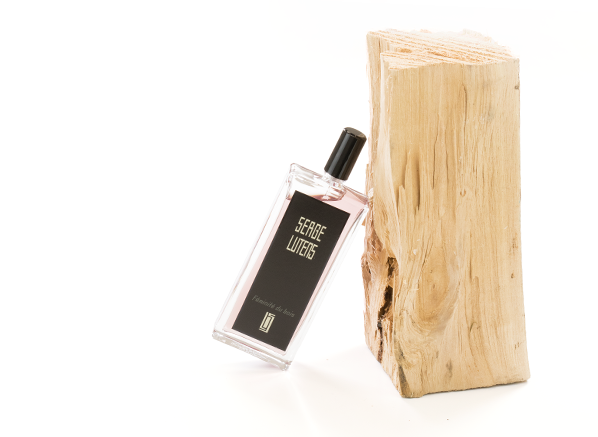 At its core, Feminite du Bois is a fragrance based on the multifaceted note of cedar wood, a tree that finds itself at home in the Atlas Mountains of Morocco, where Monsieur Lutens has also found himself a home. The material smells rich and spicy, with an almost nutty, pencil-like facet. In Feminite du Bois the spice element is amped up and gives the impression of spicy skin, whilst purple fruits like plum bring a tartness. Wearing Feminite du Bois is like wrapping oneself in champagne pink coloured silk. It is iconic and a reference woody fragrance for any collector. Butching things up a bit, we have 2 Man from Comme des Garcons – a cult favourite and one of my go-to woods. Interestingly enough though, this one is as much about incense as it about woods. 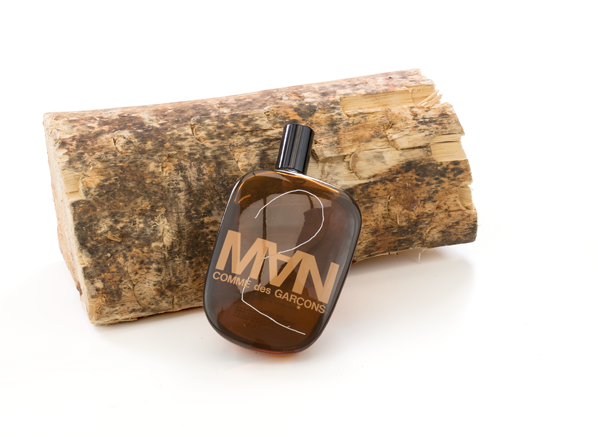 It has a cool mineral feel that is accented by aldehydes, which bring upon a ‘snuffed out candles’ effect, whilst the warmth of cedar, which in this guise is a little bit sweaty and hairy, brings out all of the sexiness. It’s the kind of fragrance I like to smell on a guy as much as I like to wear it myself and it’s one of the reasons that Comme des Garcons became such an iconic purveyor of subversive scent in the 1990s. I wouldn’t be without a bottle, ever. Goutal Paris’ latest addition, Bois d’Hadrien is actually one of my recent fragrance crushes – heck, let’s just call what it is: an olfactory obsession. Inspired by a classic Goutal fragrance, the iconic Eau d’Hadrien, this self-referential fragrance is all about the fusion of Italian cypress and citrus. It intends to evoke the idea of sunset in the sky over Tuscany and it does so with a scent that gives the impression of dried citrus fruits (oranges and lemons) and rich, dry woods that have roasted in the sun all day. It is presented with wonderful transparency, with just the right amount of richness, creating a woody fragrance that is transportive as well as beautiful. It’s no wonder I am obsessed with it! Aura is my latest obsession (it’s a MUGLER, so no surprises there). Since its launch I have drained an entire bottle and I’m now greedily working my way through a second. For me, this is a great example of woods as a supporting act and it would be fair to say that woods are not the first thing you are going to notice when sniffing Aura. In fact, your first impression is going to be of a slightly off-kilter, medicinal greenery that is juicy and sharp, followed by a lush rainforest filled with orange blossom. 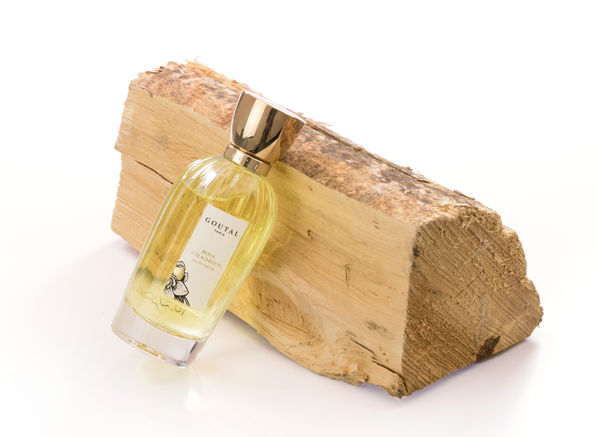 The woods come much later and bring a contrasting smokiness (thanks to a material called Wolfwood) that cuts through the humidity of Aura’s jungle, allowing it to be enveloped in a fog of tropical vanilla. 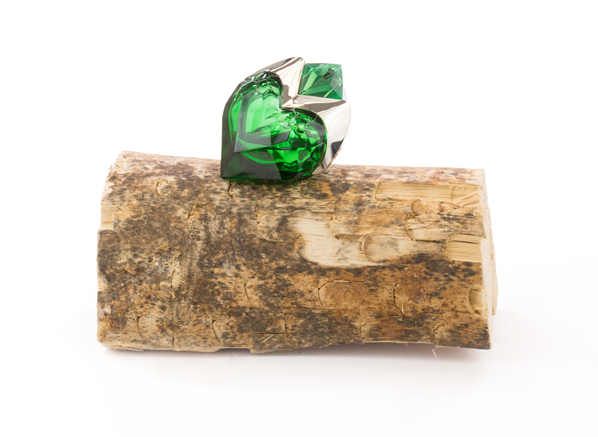 Aura is a fusion of the botanical and the animal, but it’s also a shining example of how woods (or even the impression of woods) can bring extra layers of depth to a fragrance. I loved this fragrance when it was under the Shiseido brand, and thought it had been discontinued, so I was delighted to find it again. It seems a little softer than the original, the individual notes more blended, a bittersweet wood that almost smells like rose at times. It's somehow both very clean and subtly sensual. If it was a fabric, it would be charcoal grey crepe de chine. I find it doesn't change over the hours, it simply deepens. Just as suitable for the office as an evening out. This entry was posted on Wednesday, July 18th, 2018 at 9:30 am and is filed under Candy Perfume Boy, Fragrance, Tried & Tested. You can follow any responses to this entry through the RSS 2.0 feed. You can skip to the end and leave a response. Pinging is currently not allowed.